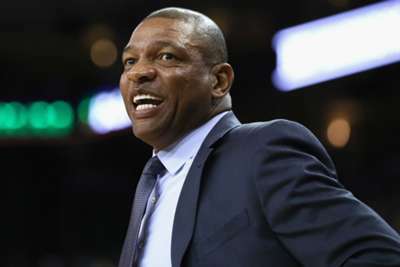 Doc Rivers addressed links to the Los Angeles Lakers, saying he had no plans to leave the Clippers. The Clippers coach has been linked to the other job in Los Angeles, but he said on Tuesday there was "no truth" to those reports. Rivers said he is close friends with Lakers president Magic Johnson. However, he said his job is not done with the Clippers. "I have a job and the Lakers have a coach. I'm going nowhere," he said, via the Los Angeles Times. "I can tell you that straight and up front. I'm going to be here until Steve [Ballmer, owner] says 'Get out.' I plan on being here a long time. "So that we never talk about this for a while, let me end this right now. Magic Johnson and I are very close friends, as you know. And that's what we are. I have great respect for him. But … Steve Ballmer and I have a great relationship." Rivers also revealed he had a clause to leave the Clippers this offseason, but decided to remove that and make his deal a longer one. The Clippers entered Tuesday at 41-30 and holding the last playoff spot in the Western Conference. Although they traded their leading scorer, Tobias Harris, to the Philadelphia 76ers, they appear likely to make the postseason and are set to be in the race to sign top free agents. The Lakers, on the other hand, do not seem likely to creep into the playoff race, as they sit 9.5 games behind the Clippers with 11 regular-season games remaining.